Bike MS 2015 training is in full swing! Well, it’s official. I’ve signed up for my 8th annual Bike MS ride and started training 3 weeks ago! For the second year in a row, I’m doing the Sam’s Club Round Up Ride in DFW on the first weekend in May. I had originally planned to choose a different ride, but our schedules this year just didn’t allow it. Plus, they’ve changed up the Sam’s Club Round Up Ride so that it ends in downtown Fort Worth’s Sundance Square on Sunday, rather than ending at the Texas Motor Speedway both days. Thanks to you, I achieved top fundraiser status last year, so that should make this a good year. I haven’t yet set up my fundraising page, but I did have an interesting training ride last weekend that I wanted to share. 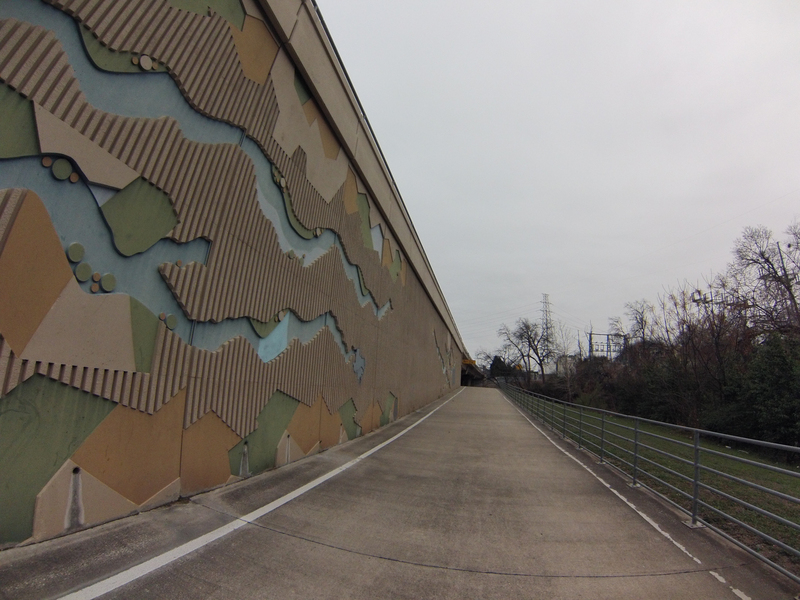 We were in Dallas to tour some breweries and I took my bike and explored the paved hike and bike trails in the area. 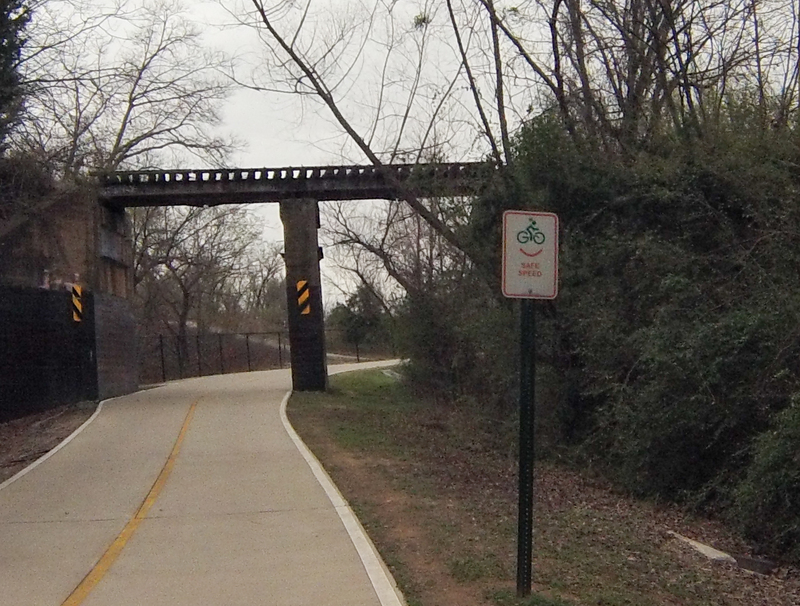 There are many miles of bike trails in Dallas, but almost no bike lanes. We stayed right downtown at the Magnolia Hotel and I took off from there Saturday morning. You can see my 41 mile route on Garmin Connect. 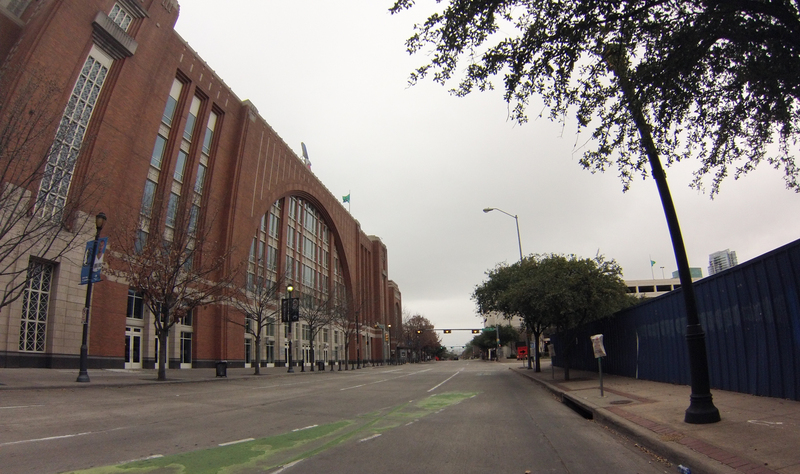 I rode along bike routes, which were sharrows, not dedicated bike lanes, down past the American Airlines Center to pick up the Katy Bike Trail. 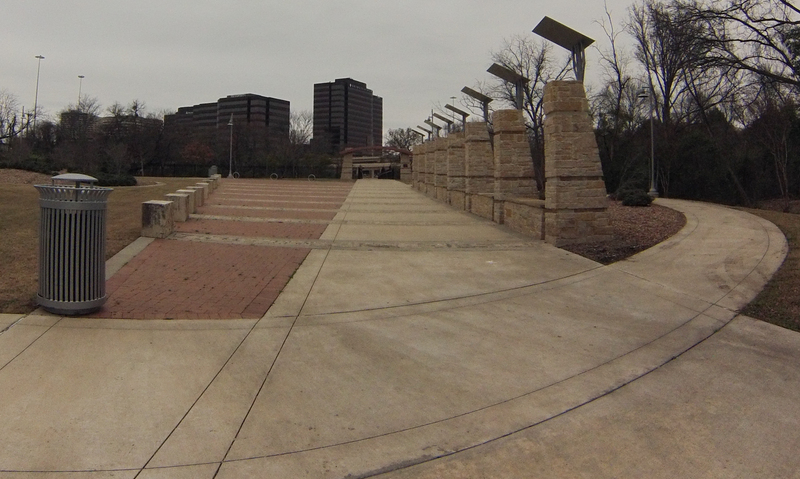 The Katy Trail was a popular place to be on a Saturday morning. Luckily, it had two paved sections for most of its length, half of which was for pedestrians only. After coming to the end of the Katy Trail, I rode on the streets for a while and passed through Southern Methodist University (SMU). 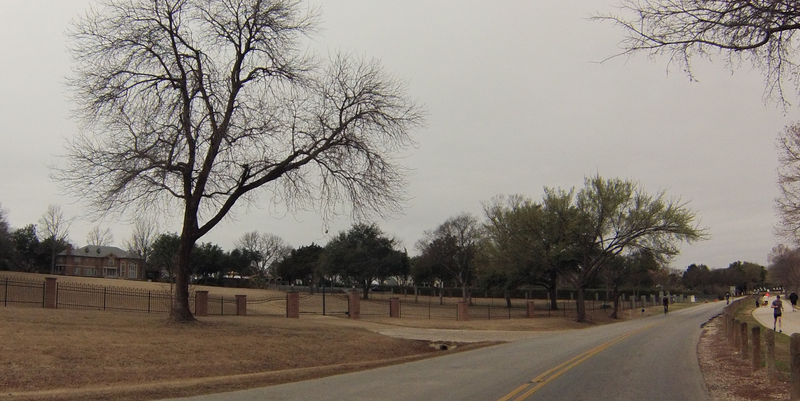 Next I came to White Rock Lake, a nice lake with hiking and biking all around it just north of downtown, with some very nice houses over looking the lake. 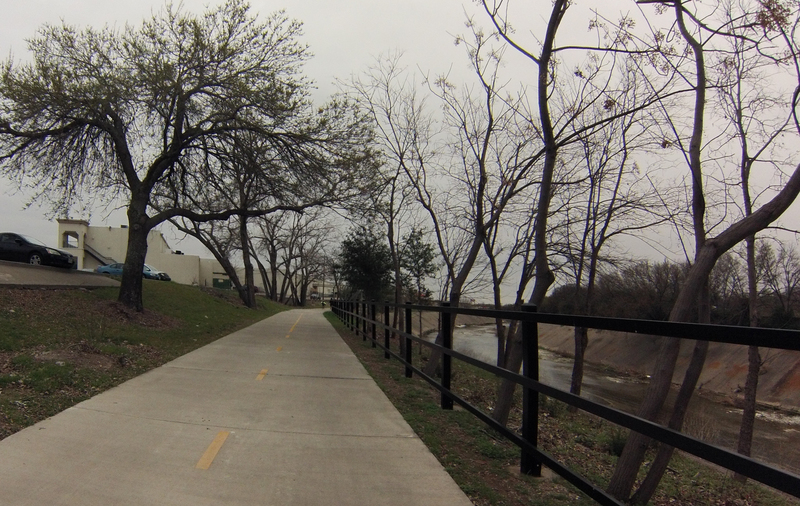 At the north part of the lake, I exited onto the White Rock Creek Trail. It was nice and new in some sections and quite old in other sections. It was fairly flat and not that crowded. 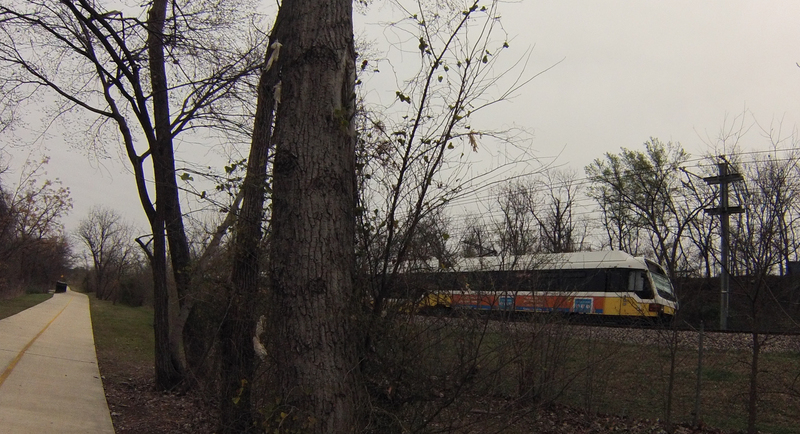 Saw the Dallas train a few times – the DART. After a while I split off on to the Cottonwood Trail, which was a new trail. 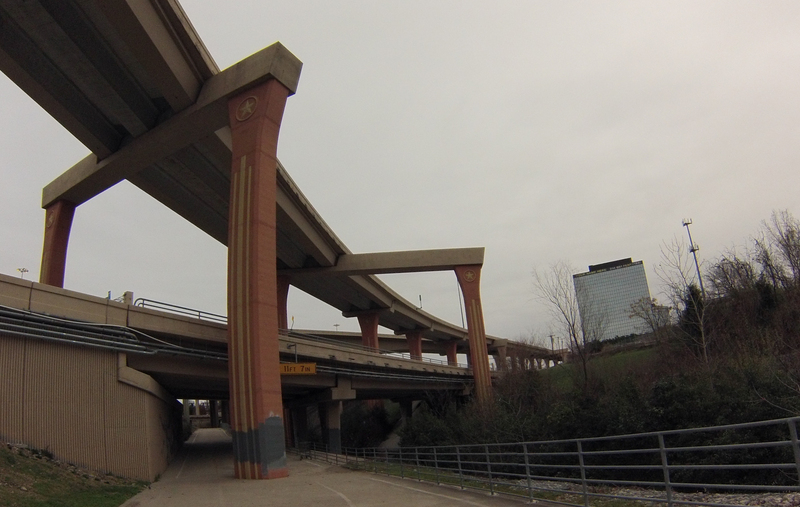 The Cottonwood trail took me under intersection of interstates 635 and 75. At the top of the Cottonwood trail, I cut over on some streets to Valley View Park to pick up the north end of the White Rock Creek Trail. 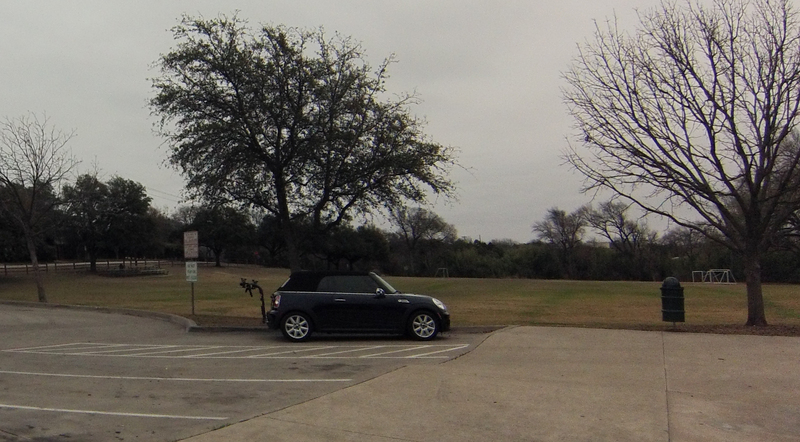 I saw a Mini Convertible that had a bike rack just like the one I used to have – including bike and beer stickers on the bike rack! 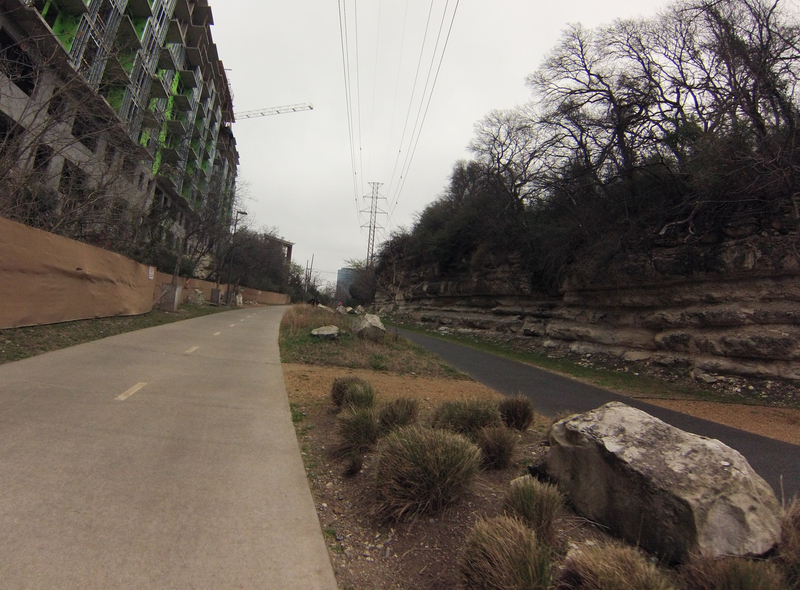 The While Rock Creek Trail returned me to White Rock Lake right where I left. 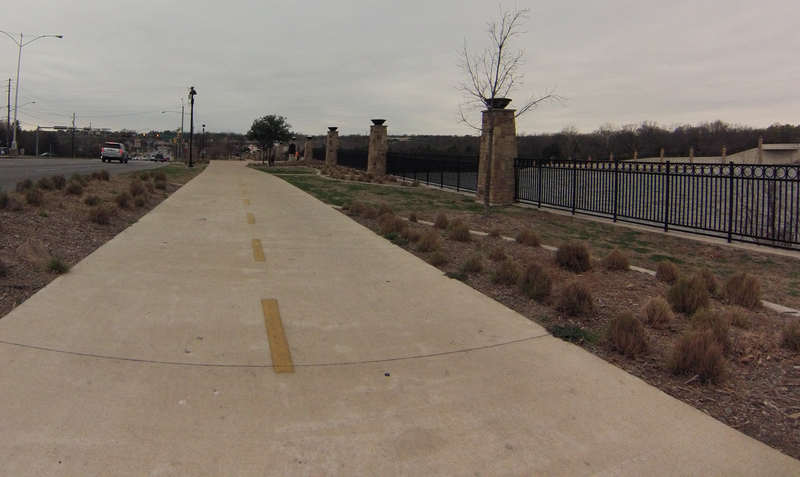 The trails along the lake switched between open and closed road and paved trail. 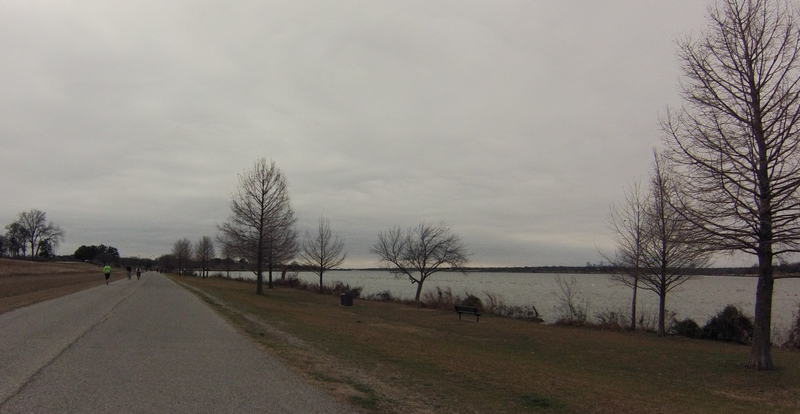 It’s small in this photo, but I could see downtown Dallas from a number of places along the lake. 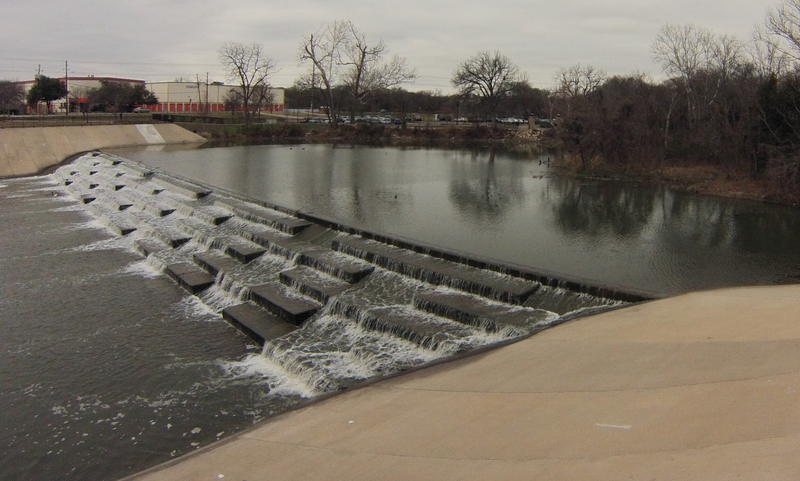 I left the lake for the Santa Fe Trail by the White Rock Lake Dam. 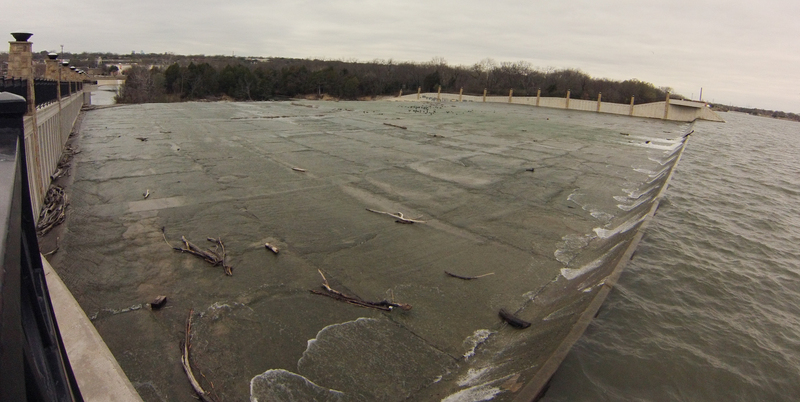 It was a long sloping dam. The trails often had these happy little bike signs reminding people of proper etiquette when sharing the trails. The Santa Fe Trail took me to Deep Ellum, a neighborhood just outside of Dallas that totally reminded me of East Austin. The trail obviously used to be train tracks at one point. After the trail ended I had just a mile or two left to get back to our hotel. 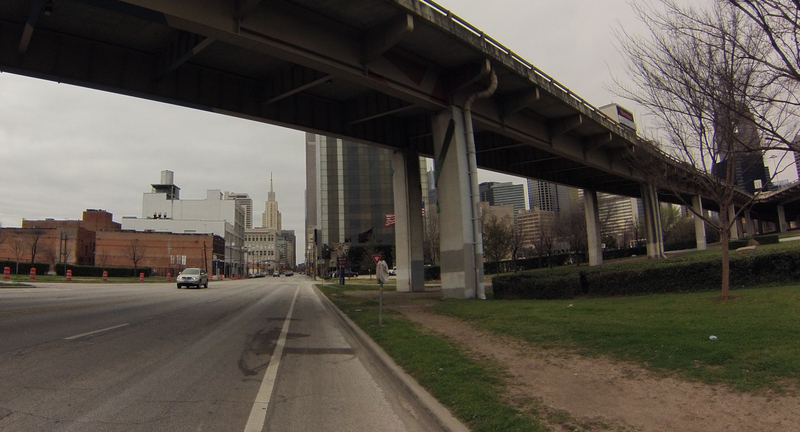 I found a bike lane on one road, but mostly sharrows. Luckily there aren’t many cars out in downtown Dallas on a Saturday late morning. I have a friend M.S. this is a great cause. This ride in North Carolina is definitely on my to do list. Good Luck. Thanks! I strongly recommend you try the ride, it’s quite the experience!